Below you will find links, photos, and brief descriptions relating to SouthCarolina and the Greenville area. Start your visit with the State of South Carolina Public Information Page. 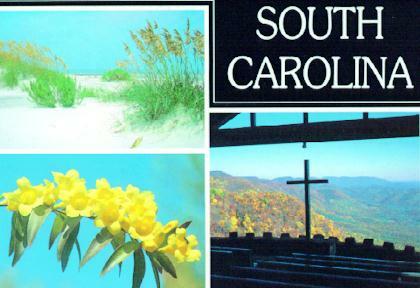 Visit the South Carolina Home Page for great information and links to other areas of the state. Visit one of my favorite links at SCIway.net. It is loaded with a wide variety of information about the state. Subscribe to the free newsletter while you are there. 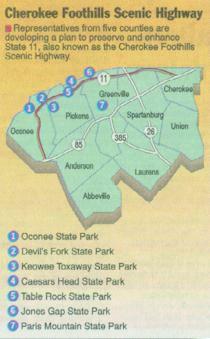 A link to the six county up-state area is a first stop for information specific to the upstate. This site is a very good web page with information regarding Business & Industry, Schools & Libraries, Government, News & Weather, Recreation & Tourism, and Relocation & Retirement. The Greenville News internet version is available at Greenville Online. Classifieds, real estate, the Greenville Community activities, etc, events, dining out and information on the public schools can be found at these sites. Really want to know about the educational system? Go to the state department of education web page. Links to Bob Jones University, Clemson University, Furman University, The University of South Carolina, and The University Center (a seven (7) university partnership program with undergraduate and graduate programs, all in Greenville, SC). Interested in still more information? A photo of the State, the State seal, and the State flag and a photo of several scenes of South Carolina. South Carolina, the Palmetto State. The State flag features a palmetto tree on a blue background. South Carolina: the origin of the name was in honor of Charles I of England. Nicknamed the Palmetto State, The capital is Columbia. Mottos: "Prepared in Mind and Resources" and "While I Breathe, I Hope." Total area: 30,225 Sq. miles. The State Capitol, in Columbia, SC. Located in uptown Columbia, the State House is the location of both the Governor's Office and the General Assembly and is the center of state government. Begun in 1855, the building was not completed until after 1900. The building withstood shelling by Sherman's Army during the War between the States. The State House. Here is another photo of the State House. The Governor's Mansion, built in 1855 as officer's barracks of the Arsenal Academy, it is the only building of the school to escape Sherman's burning. Landscaped and remodeled, the building is now a showplace for tourists. The Boylston House, located within the Governor's Mansion is the restored house, c. 1830. The house and gardens are now available to the public for private receptions, meetings, and other civic affairs. Greenville-Spartanburg Airport. One of the prettiest gardens located on any airport of any size is in front of the modern Greenville-Spartanburg terminal. Greenville, SC sits at the foot of Paris Mountain and is home of some of the world's largest corporations including textiles and construction. Greenville is also noted for its cultural achievements and houses one of the most important collections of religious art in America. The County is part of the old Cherokee lands that were deeded to South Carolina in 1777 and named in honor of General Nathaniel Greene of the Revolutionary fame or named for an earlier settler, Isaac Green. Main Street has been 'remodeled' and is tree lined. Greenville is the industrial center of the Piedmont and stands on the hills near the falls of the Ready River. The Reedy River Falls Historic Park is located at the west end of Main Street. It is the attractive success of the Carolina Foothills Garden Club. The home in the photo was built in 1894 by W.E.Touchstone, now called Falls Cottage, and serves as a fine restaurant and art gallery. Freedom Weekend Aloft is one of the largest hot air balloon festivals in the United States. Caesar's Head State Park, SC . 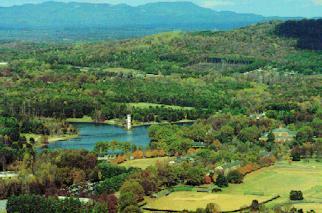 A view showing the Greenville Watershed and Table Rock State Park in the background. The rock juts from the mountainside 1,200 feet above the Saluda River Valley. The formation in the foreground in both photos is known as Caesar's Mouth. Can you believe this view from Caesar's Head State Park? Cherokee Foothills Scenic Highway is actually State Highway 11. Representatives from five counties are developing a plan to preserve and enhance the highway. You will find locations on this 'map' for: Oconee State Park, Devil's Fork State Park, Keowee Toxaway State Park, Caesar's Head State Park, Table Rock State Park, Jones Gap State Park, and Paris Mountain State Park. 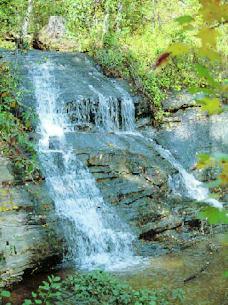 Wayside Falls, near Cleveland, SC is one of dozens of beautiful waterfalls in South Carolina. Blue Ridge Beauty. This photo shows a section of The Cherokee Foothills Scenic Highway (State Highway 11), "presenting the Upstate at its natural best." 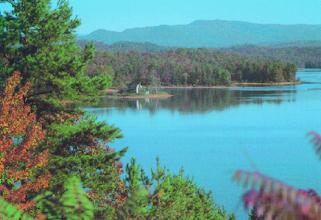 Devil's Fork State Park is located off of Highway 11, in Pickens County on Lake Jocassee (500 acre site). Facilities include furnished cottages, campsites, picnic area with shelters, park store, boat ramp, bathhouse, and swimming area. Devil's Fork is where our daughter Kimberly and I completed our SCUBA certification on a cold, rainy, windy, December day. Lake Jocassee, located in the South Carolina Mountain Foothills, is a beautiful lake formed by the Keowee, Whitewater and Thompson Rivers in upper Oconee County, bordered by Pickens County. Just below Lake Jocassee is Lake Keowee. 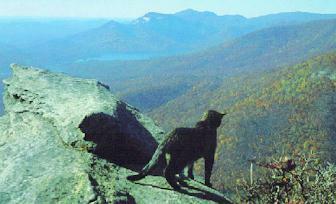 This is a view from the Cherokee Foothills Scenic Highway (SC Highway 11). 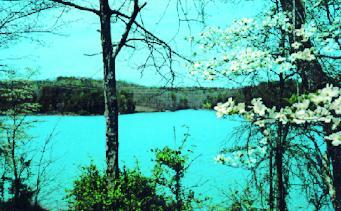 Table Rock Reservoir in Pickens County, SC, is quiet a sight---the watershed is beautiful on a crystal clear day! Table Rock from Palmetto Cove enchants the visitor on an autumn morning. 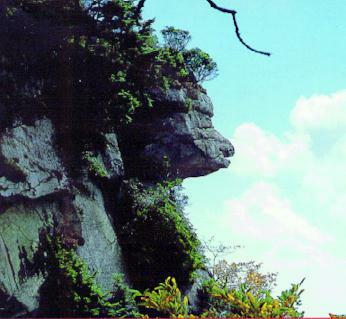 Click here for a link to more Table Rock State Park info. Chattooga National Wild & Scenic River is one of America's best known wild and scenic rivers, made famous by the movie "Deliverance." The river divides South Carolina and Georgia for more than 40 miles and drops an average of 50 feet per mile. 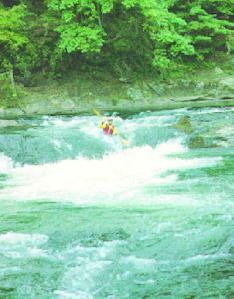 I have rafted the river several times----very exciting! Eastatoe Falls in Pickens County, SC, is a perfect setting for relaxing and enjoying the refreshing mist of the waterfall. Whitewater Falls is located near the state line between South and North Carolina. This scene is of the upper falls in North Carolina and when combined with the lower falls (in South Carolina) forms the highest cascade in the eastern US. 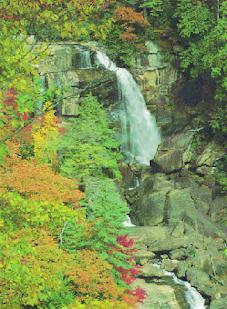 Raven Cliff Falls, one of more than 30 outstanding cascades that are located in upper South Carolina. Raven Cliff, on Matthews Creek in Greenville County, is a two mile walk from the highway just north of Caesars Head State Park. The falls are over 400 feet high. 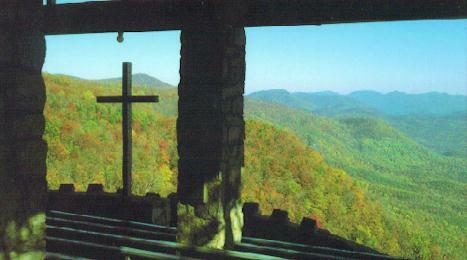 Pretty Place, the Fred W. Symmes Memorial Chapel is located at the Greenville, SC YMCA Camp off of US Highway 276 between Brevard, NC and Travelers Rest, SC. This view from the Chapel is breathtaking. Hartwell Dam and Lake, located between Anderson, SC and Hartwell, Ga. The lake borders South Carolina and Georgia extending 49 miles up the Tugaloo River and 45 miles up the Seneca River. Completed in 1963, the dam contains 56,000 acres of water and a shoreline of almost 1,000 miles. The lake is bisected by Interstate 85. This view on a spring day is a peaceful look at the lake. Campgrounds, parks and boating launches cover the lake from Clemson down to the dam near Hartwell, Georgia. Furman University is a modern campus located in a beautiful tree covered setting just north of the city and within sight of the Blue Ridge Mountains. Founded in 1826, the university has grown into one of the finest academic institutions in the state. Bob Jones University owns one of the finest and largest collections of sacred art and rare Biblical antiquities. 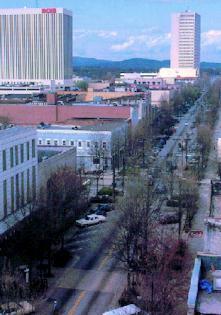 The University is located near downtown Greenville. 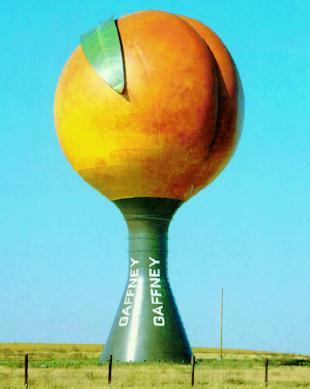 Peachoid: The amazing Giant Peach is located along I-85 in Gaffney, SC. The giant peach is actually a cleverly disquised (?) water tower. South Carolina produces more peaches each year than any other state in the nation. 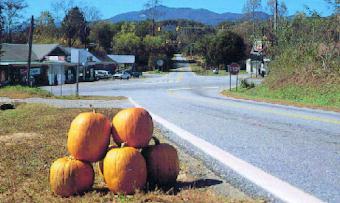 Pumpkintown, SC is a small Pickens County community in the Oolenoy Valley with the Blue Ridge Mountains in the background. Founded in 1743 by an old Scot from Lochlomund named Cornelius Keith, the community becomes magically alive every fall during the Pumpkin Festival. Click here for more information on the Festival. Cowpens National Battlefield located north of Spartanburg, SC, a famous Revolutionary Battleground where American Troops under Brig. General Daniel Morgan won a victory over the British. 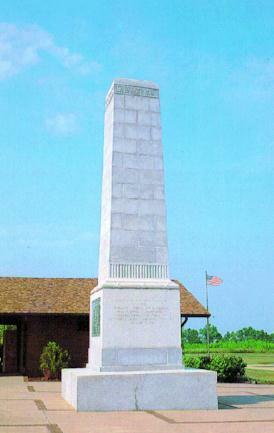 The battle in January, 1781 became the second link in a chain of events on the march to victory at Yorktown. The pattern for using militia in this battle was copied successfully in three later battles. Fort Hill, located in Clemson, SC, is the old plantation home of South Carolina's famed statesman, John Caldwell Calhoun. Fort Hill is open to the public. Calhoun wrote many of his famous speeches here and lived on the plantation from 1825 until his death in 1850. 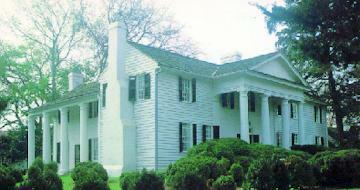 The Beattie Home is located in Greenville, SC and was erected in 1834. 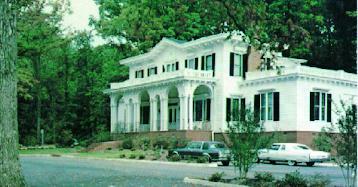 The home was used as a private residence until 1948 when it was relocated and restored for the Greenville Women's Club. This beautiful home with period furnishings is listed on the National Register of Historic Places. .... or just click on this button if your browser supports "Mail To." Any and all material herein is protected by Copyright � 1992 � 2014 The Sinclair Group, Inc. All Rights Reserved. Nothing from this website may be copied or reproduced, in part or whole, or in any manner, without the express written approval of the owner of this website or the author of the particular work. This includes, but is not limited to, all photos, stories, graphics, and information on this website.